It’s official! We will have the chicken coop inspected Jan. 29. Yesterday I received a call from Ferndale City Hall asking when I planned to submit my permit application. I was confused since I had just filled out paperwork in October. She politely explained that I had submitted for 2013, and it is now 2014. She also said I could set up an inspection date when I turned everything in. 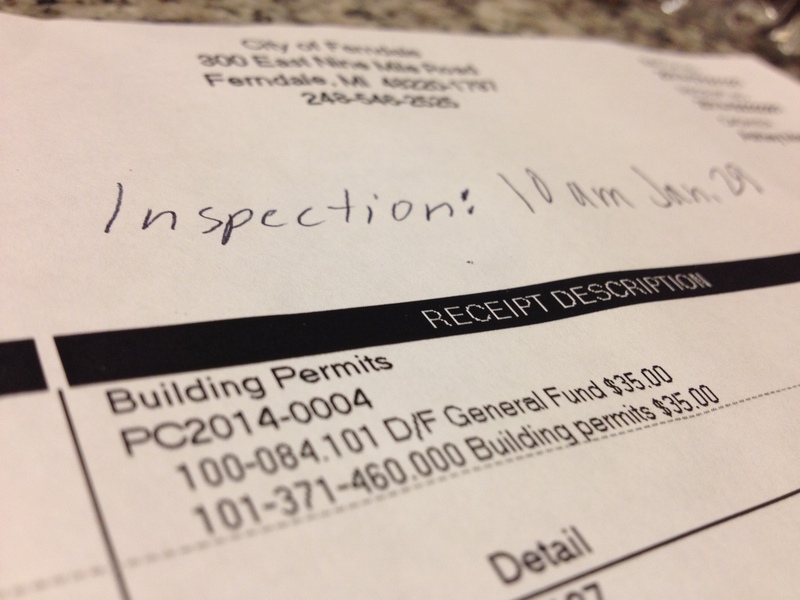 When I went to city hall, the clerk noticed that I never had the coop inspected last fall. “You have to get that done within 30 days of pulling a permit,” she said, with a smile. “Thirty days to build a coop?” I asked, incredulous. It’s taken us almost three months to get it to this point, meaning we still need to complete the hen house door. As novice builders (we had zero experience when we started this project) I couldn’t imagine finishing it at a faster pace. “You have some lucky chickens,” she said. Since the inspector is on vacation next week, I decided to schedule the inspection for Jan. 29. We still have a few things to do before he arrives. While I was finishing up my paperwork, I asked the clerk how many Ferndale residents have applied for chicken coop permits. She quickly counted, then said, “Twelve.” When we filed our initial papers last fall, the clerk told me we were the 10th household to file. It seems our chicken revolution is taking hold! In chick-related news, I heard back from Cedar Creek Hatchery, where we plan to get our hatchlings. The owner told me he expects to start having chicks in late February or early March. He suggested that I call back then and set up a time to pick up our special delivery. It seems just around the corner. In the meantime, I’ll have plenty to keep me busy. Once we finish the hen house door, we still have some trim to finish, and need to install the chicken ramp along with mesh on the two windows. We’ll also have to build a brooder to house the babies until they are strong enough to live outside. Because, yes. We will have babies in the house! Congratulations on your beautiful coop! I am so glad that someone challenged Ferndale’s rules and that you will be legal. I have seen some sad stories on Backyard Chickens where people had illegal chickens and had to get rid of their birds. You are going to love them, and you will never want another store bought egg! Thanks so much! We finally installed out hen house door today, so I’m pretty much ready for inspection. Tons of little things to do, but nothing that should hold up the process. Do you live in Ferndale? How many hens do you have?